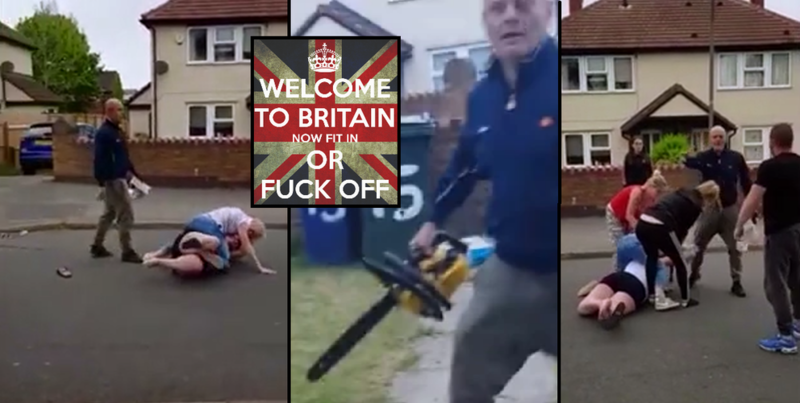 A Yorkshire, England thug by the name of Stewart Palmer decided to skip a few steps, and when he realized he couldn’t win an epic street brawl he had started with his neighbours, he returned home and broke out the old chainsaw, to terrifying results. 28-year-old mother Jess Appleby, on the receiving end during most of the street fight in Yorkshire’s streets, shot the video showing Mr Palmer trying to burst into her home with the terrifying power tool at the end of the neighbourly battle. Mr Palmer, who has since been jailed for the attack, starts to confront Miss Appleby and her partner Dean Brown in their garden on a Yorkshire street. Things quickly escalate into a fist fight between Mr Palmer and Mr Brown after the former refused to leave the couple’s property. The young mother then gets involved herself and the brawl erupts into a mass fight with other neighbours as well. Children can be heard screaming and crying in the background during the whole ordeal. Other neighbours intervene, trying to break up the fighters but struggle to separate them. Just as things seem to calm the two couples continue to verbally abuse each other over a garden fence. At this point, Mr Palmer can be seen to walk away but he returns with a roaring chainsaw. A police spokesman declared afterwards that: "Stewart Palmer was jailed on July 20 at Sheffield Crown Court for 24 months. He was charged with affray, having an offensive weapon and criminal damage to property." The UK way I guess? What a shitshow!